The first week of the new decade is finally over. Hooray! 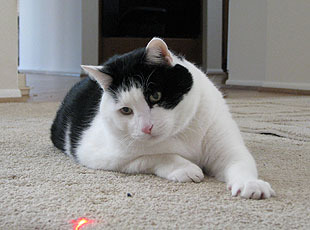 And that means the first Friday catblogging of the new decade is here. Hooray again! 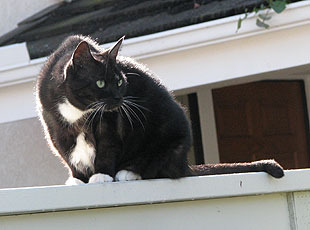 To start off the new year, Domino is back up on the fence and obviously keeping a keen eye out for an inattentive bird. Sadly for her, birds around here are plenty attentive, and she has no front claws to hunt them down with in any case. On the right, Inkblot, well aware that birds are out of his weight class, is protecting the house from malevolent laser pointers instead. All for the best, I think.